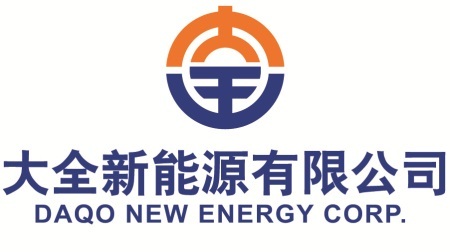 CHONGQING, China, Feb. 5, 2015 /PRNewswire/ -- Daqo New Energy Corp. (NYSE: DQ) (the “Company”), a leading polysilicon manufacturer based in China, today announced that the Company has priced a registered follow-on offering of American depositary shares (“ADSs”) at US$19.50 per ADS. The Company will issue and sell 1,540,000 ADSs. Each ADS represents 25 ordinary shares of the Company. The Company intends to use the net proceeds from this offering for general corporate purposes, including studying the feasibility of further expansion of its business, and working capital. Credit Suisse Securities (USA) LLC is acting as the sole book-running manager and underwriter of the offering. Duke Elite Limited, an affiliate of one of our directors, Mr. Xiang Xu, who is also President of Daqo Group Co., Ltd, has subscribed for, and has been allocated by the underwriter, 1,025,641 ADSs in this offering, at the same offering price and on the same terms as the other ADSs being offered in this offering. This offering is being made only by means of a prospectus supplement dated February 5, 2015 and an accompanying prospectus included in a registration statement on Form F-3 filed with the Securities and Exchange Commission on December 23, 2014, which became effective under the U.S. Securities Act of 1933 on January 7, 2015. This announcement shall not constitute an offer to sell or the solicitation of an offer to buy, nor shall there be any sale of, these securities in any jurisdiction in which such offer, solicitation or sale would be unlawful prior to registration or qualification under the securities laws of any such jurisdiction. The securities referred to herein have not been and will not be registered under the applicable securities laws of any jurisdiction outside of the United States of America. Copies of the prospectus supplement and the accompanying prospectus may be obtained from Credit Suisse Securities (USA) LLC, Attention: Prospectus Department, at Eleven Madison Avenue, New York, New York 10010-3629 or by telephone at (800) 221-1037. Daqo New Energy Corp. is a leading polysilicon manufacturer based in China. Daqo New Energy primarily manufactures and sells high-quality polysilicon to photovoltaic product manufacturers. It also manufactures and sells photovoltaic wafers. For more information about Daqo New Energy, please visit www.dqsolar.com. This announcement contains forward-looking statements. These statements are made under the “safe harbor” provisions of the U.S. Private Securities Litigation Reform Act of 1995. These forward-looking statements can be identified by terminology such as “will,” “expects,” “anticipates,” “future,” “intends,” “plans,” “believes,” “estimates” and similar statements. Among other things, Daqo New Energy’s strategic and operational plans contain forward-looking statements. The Company may also make written or oral forward-looking statements in its reports filed or furnished to the U.S. Securities and Exchange Commission, in its annual reports to shareholders, in press releases and other written materials and in oral statements made by its officers, directors or employees to third parties. Statements that are not historical facts, including statements about the Company’s beliefs and expectations, are forward-looking statements. Forward-looking statements involve inherent risks and uncertainties. A number of factors could cause actual results to differ materially from those contained in any forward-looking statement, including but not limited to the following: the demand for photovoltaic products and the development of photovoltaic technologies; global supply and demand for polysilicon; alternative technologies in cell manufacturing; our ability to significantly expand our polysilicon production capacity and output; the reduction in or elimination of government subsidies and economic incentives for solar energy applications; and our ability to successfully implement our vertical integration strategy. Further information regarding these and other risks is included in the reports or documents we have filed with, or furnished to, the Securities and Exchange Commission. Daqo New Energy does not undertake any obligation to update any forward-looking statement, except as required under applicable law. All information provided in this press release and in the attachments is as of the date of this press release, and Daqo New Energy undertakes no duty to update such information, except as required under applicable law.